Selecting the best nursing school in Ohio can be difficult. To make the process easier first look for a school that supports students towards licensure and beyond. A great way to measure this is through NCLEX-RN "pass rates." We have ranked the top 30 nursing schools in Ohio by analyzing current and historical NCLEX-RN "pass rates", meaning the percentage of graduates who pass the exam, out of the 92 RN programs in the state. Programs reviewed include schools that offer an Associate in Nursing (ADN/ASN), BSN, or Direct-Entry MSN Degree. 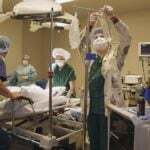 The state of Ohio is forecasting a need for more highly skilled nurses to bolster the current science-based health care system. The state is looking at an estimated 4,200 annual increase in open job opportunities and are looking for well qualified candidates. Luckily, there is no shortage of schools with nursing programs in Ohio. 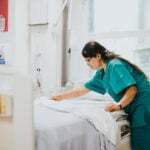 With the Bureau of Labor Statistics reporting the average annual salary for a registered nurse in the state at $62,800, gaining an education in the field is a smart move for those seeking gainful employment in the booming world of healthcare. While there are many educational routes to becoming a registered nurse, an Associate's Degree in Nursing (ADN) is a great place to start. This popular program takes just 2 years to complete, making it a relatively quick route to your RN, and typically less expensive than other programs due to its short duration. ADN programs are commonly found at community and/or technical colleges. 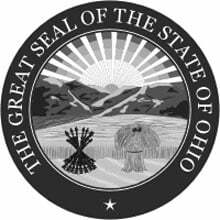 Ohio has over 40 schools that offer accredited, board-approved ADN programs. Plain and simple, a legitimate ADN program will boast accreditations from national and local educational nursing organizations. 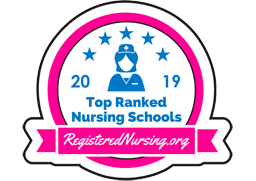 A few to look for on the national level are the Accreditation Commission for Education in Nursing (ACEN) and the American Association of Colleges of Nursing's Commission on Collegiate Nursing Education (CCNE). You will also want to be sure that any program you consider has local approval from the Ohio State Board of Nursing. To receive a nursing license, you'll need to first earn your ADN degree, and then you'll need to pass the National Council Licensure Examination (NCLEX). If you don't pass the NCLEX, the Ohio State Board of Nursing cannot give you a nursing license. It's a good idea to check out the curriculum of the ADN program you are interested in to ensure that it will thoroughly prepare you to pass the exam. In 2015, the American Association of Colleges of Nursing reported that 81.2% of new nurse grads in the state who took the NCLEX that year received a nursing license. Stark State College, located in North Canton, OH, is just one school in the state offering a properly accredited ADN program. There's a lot to think about when considering program costs. You'll need to budget for the main fee of tuition, but don't forget that there are often other associated fees, including textbooks, uniforms, parking, and more. Be sure to do your due diligence when inquiring about a program's fees so that you aren't surprised by any extra costs. To provide an example on cost, the total estimated ADN program tuition at The Christ College of Nursing and Health Sciences in Cincinnati is $36,565, plus the cost of textbooks, fees, and school supplies. An ADN program is a great choice for those who want a shorter amount of time in school so that they can go right into working as an RN. This program is also ideal because it is so widely available at smaller schools like junior colleges, meaning that you don't need to reside in a larger city with a big university in order to attend. ADN degrees also tend to be less expensive than other nursing programs. Nurses currently credentialed as Licensed Professional Nurses (LPNs) can enroll in special programs to become registered nurses. These LPN to RN bridge programs have multiple options: the LPN to ADN for the most basic pathway, or the LPN to BSN for a bachelor's degree. With a little more schooling, a Bachelor's of Science in Nursing (BSN) can be achieved. This traditional 4-year program is most often found in larger universities, and will lead to higher salaries and more advanced nursing careers. If you are considering nursing as a second career, accelerated BSN programs are available to those who already hold a bachelor's degree or higher in another field. Many schools also offer an RN to BSN program for registered nurses that want to advance their careers. There are roughly 45 schools throughout Ohio that offer some type of BSN program, giving students in the state a wealth of choices. It's advisable to look into any prospective school before deciding on where to spend your hard-earned money for a BSN degree. Things like cost, proper accreditation, and favorable program outcomes should be at the top of your list when comparing different programs. Because Ohio has an abundance of schools offering a BSN, location should also be part of your consideration, as you'll want a school that's conveniently located. Youngstown State University is one Ohio school offering an accredited BSN program. There are a few different types of BSN programs, each with a slightly different duration. A traditional, pre-licensure BSN program will last 4 years. An accelerated BSN program, which is gaining in popularity throughout the country, is designed for those who already hold a bachelor's degree in another subject and will take approximately 15 months to complete. Lastly, an RN to BSN program is an option for those who already hold a nursing license and requires about 120 credit hours. 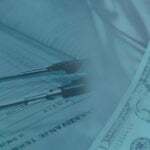 You'll need to calculate the costs of attending a BSN program with great care. Not only will you need to cover tuition, but other costs such as lab fees, books, and uniforms will need to be accounted for. Depending on your school, these additional miscellaneous costs may or may not be included with tuition, and room and board fees are usually separate as well. To give you an idea regarding cost, the estimated standard program tuition and fees for a BSN at the University of Cincinnati is $5,928.25 per term for Ohio residents. The main advantage to earning a BSN is the expanded career opportunities it provides. If you have any intentions of advancing in your nursing career and earning at the top of the pay scale, you'll need a BSN at the very least. BSN programs are also highly adaptable to wherever you are in life, whether you are a high school graduate going for a traditional BSN, a bachelor's or master's degree holder in another field wanting to start a new career in nursing, or an RN with a diploma or ADN wanting to advance. If you've earned a BSN but still want to advance in your nursing career, a Master's of Science in Nursing degree (MSN) is the next step. Earning an MSN is required for advanced nursing jobs such as Clinical Nurse Specialist, Certified Nurse Midwife, and Nurse Practitioner, among other specialties. These nursing careers definitely offer the potential for increased earnings. There are more than 5 schools in Ohio offering an MSN program. Typically, you can expect an MSN to take you 2-3 years to complete from start to finish. These programs tend to have a lot of flexible coursework options, as they cater to full-time working nurses. Night, weekend, and/or online courses are not unusual offerings. It's a good idea to check out all the scheduling possibilities when comparing MSN programs. Program costs for an MSN can vary from school to school, and will also vary depending on what kind of specialty you'd like to pursue. Generally speaking, though, you'll need to pay for tuition costs and additional miscellaneous fees for things like textbooks. For example, the estimated cost of tuition and fees for an MSN with a nursing administration specialty at Mount Carmel College of Nursing in Columbus is $16,950, not including books, housing, transportation, meals, or uniforms. Ohio State Board of Nursing requires that all candidates applying for licensure either by examination or endorsement follow the guidelines outlined below. Bridging your degree can be done in the state of Ohio, as well as accelerating your degree at one of the 10 colleges throughout the state. Accelerated BSN programs are intensive in nature due to offering full-time studies while finishing clinical hours. These programs range in length from 12 to 18 months depending on the college, and if you meet the entrance criteria. Entrance criteria are different within each program, but all programs stipulate they must be completed before the start date of the degree program. Any additional courses will add to the time frame and the tuition costs associated with the program. Check the requirements and fees more closely at the college you have chosen. Making a big leap into the top spot this year is the University of Mount Union with their 4-year BSN program. With no wait list, students can be admitted into the major as a freshman to start their nursing education right away. With features like a state-of-the-art simulation ICU, students get to enjoy first-class facilities in which to learn and practice. Follow the link to learn more about the University of Mount Union nursing program. Tri-Rivers School of Nursing can provide all the training needed to become a highly regarded nurse in the health care industry. Graduating from one of the many health care programs offered will offer competitive compensation and opportunities. Visit the Tri-Rivers School of Nursing nursing website to learn more. Trinity Health System is affiliated with two progressive medical centers and can provide the theoretical, clinical, and practical experiences graduates will need to be on the cutting edge of nursing. Learn more by visiting the Trinity Health System nursing website. At Muskingum University, students are able to earn a BSN under a curriculum that combines liberal arts and sciences with professional nursing courses. Small class sizes foster individual attention from dedicated faculty. Follow the link to learn more about the Muskingum University nursing program. Washington State Community College in Marietta offers a board-approved Associate Degree in Nursing at one of the lowest tuition rates in the state. Their program aims to help students enter the nursing profession and enjoy the employment growth that registered nursing is poised to offer. Check out the official Washington State Community College nursing program. You can have it all when attending Baldwin Wallace University. While earning your accelerated BSN and being provided a concept-based program, you will also be provided the best of both worlds. Located minutes away from Cleveland makes for a great mix of country and city living. Follow the link to learn more about the Baldwin Wallace University nursing program. Small class sizes, faculty support and post-graduate career support are some of the few attributes of the Ohio Northern University nursing program. A well-balanced BSN of theoretical and practical experiences help individuals graduate at the top of the field. Get all the program details by visiting the Ohio Northern University website. Nestled among the small historic town of Archbold, Ohio is Northwest State Community College, offering smaller than average class sizes, one-to-one faculty support and high-ranking accreditations. NSCC can prepare you for the rapidly changing demands of the health care system. Learn more by visiting the Northwest State Community College nursing website. Otterbein University’s accredited BSN program is committed to quality nursing education, preparing students for the nursing profession and encouraging life-long learning. Clinical placements begin in the first semester, allowing students to gain hands-on experiences. Visit the Otterbein University nursing website to learn more. Walsh University Gary and Linda Byers School of Nursing can offer a BSN, accelerated BSN or MSN degree. Graduates of Walsh University are given all the tools required to become real-life experienced, Christian-based nursing professionals. Follow the link to learn more about the Walsh University nursing program. Offering several different avenues to obtain a nursing degree, as well as one-to-one support from experienced faculty members is what sets Perrysburg, Ohio's Owens Community College graduates apart. Graduates from the many programs are considered an asset to any medical facility. Follow the link to learn more about the Owens Community College nursing program. Ohio State University College of Nursing has roots dating back it its inception in 1928. Known for its long standing ranking in the field of health care, graduates from this program benefit from tried and true practices, while learning in modern surroundings. Check out the official Ohio State University nursing program. Canton’s Malone University is home to a School of Nursing offering a fully accredited BSN program. Their program focuses on providing service to God, self, and persons in need. Malone’s faculty and relationships with local healthcare providers help students secure rewarding clinical experiences. Follow the link to learn more about the Malone University nursing program. Firelands Regional Medical Center School of Nursing in Sandusky, Ohio is known for its high standards and top performance; it is considered one of the top ranking institutions in the state. Training and lifestyle balance is the key to their graduates' high performance. Follow the link to learn more about the Firelands Regional Medical Center School of Nursing nursing program. Located in Canton, Aultman College offers a myriad of nursing degree choices, including ASN and BSN programs. Small class sizes, personal attention from faculty, and state-of-the-art technology make Aultman a great place to earn a nursing degree. Learn more by visiting the Aultman College nursing website. Located in Piqua, Edison State Community College offers an Associate Degree in Nursing program with coursework delivered in classrooms, laboratories, and clinical training sites. Upon graduation, students are prepared to provide evidence-based, patient-centered care. Follow the link to learn more about the Edison State Community College nursing program. Ohio Valley Technical College’s ADN program is centered around compassion, critical thinking, and problem-solving skills. Nursing curriculum is delivered in classrooms, skills laboratory, and clinical practice settings. Check out the official Ohio Valley College of Technology nursing program. Case Western Reserve University is located on a vast 550-acre campus just east of Cleveland, Ohio. The nursing programs are rigorous, but give graduates the upper hand as a top ranked professional in the health care field. Check out the official Case Western Reserve University nursing program. The nursing programs offered at Ashland University - Dwight Char College of Nursing focuses on the 'integrity, caring, accountability, respect and excellence' philosophy (I-CARE) which is how their graduates distinguish themselves from others in a professional capacity. Visit the Ashland University nursing website to learn more. Cincinnati State’s Bethesda School of Nursing prepares tomorrow’s nurses by offering an accredited ADN program. Graduates of the program are prepared to work in a variety of settings, including acute care units and extended health care facilities. Get all the program details by visiting the Cincinnati State website. Whether students are looking to gain BSN, MSN or DNP nursing degrees, Wright State University - Miami Valley College has the ability to provide an outstanding theoretical and practical program. Check out the official Wright State University nursing program. The Mount Carmel College of Nursing offers numerous nursing pathways, including one of the largest BSN programs among the state’s private college nursing programs. An affiliation with Mount Carmel Health System, combined with small class sizes, make this school stand out from the rest. Learn more by visiting the Mount Carmel College of Nursing nursing website. Cleveland State University is in the core of Cleveland, on a sprawling campus that boasts newly renovated, state-of-the-art facilities. CSU offers a rigorous, community-based BSN program that prepare graduates to adapt to the ever-transitioning health care field. Follow the link to learn more about the Cleveland State University nursing program. Located in Columbus, Capital University’s BSN nursing pathway prepares students for their future careers by offering a broad educational foundation. Liberal arts, sciences, and ethical thought are the pillars of the curriculum. Visit the Capital University nursing website to learn more. Kent State University students in the BSN program are exposed to an evidence-based, culturally aware program, as well preparing for the challenges and demands of an ever-changing health care field. Learn more by visiting the Kent State University nursing website. Located in the small historic town of Cedarville, Cedarville University provides their BSN graduates with a Christ-centered, exemplary program, that focuses on the 'whole-person' philosophy. Mind, body and spirit are addressed in and out of the classroom, leading to a well-rounded professional nurse. Check out the official Cedarville University nursing program. Pepper Pike's Ursuline College offers a well-respected baccalaureate nursing program. Through the rigorous curriculum, students take courses such as Bioethics, Lifespan Development, and more. Get all the program details by visiting the Ursuline College website. Herzig University - Akron Nursing program is in the metropolis of Akron, Ohio. Graduates from this program have been referenced as being top-notch professionals, from a program that offers high standards in both theoretical and clinical practice. Get all the program details by visiting the Herzing University - Akron website. The University of Akron is flanked by Lake Erie in the south and Cuyahoga Falls to the north. Nursing degree options abound at U of A, and all graduates are equipped with an in-depth knowledge of both the science behind nursing and a patient-centered approach. Visit the University of Akron nursing website to learn more. 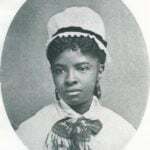 Columbus' Chamberlain College of Nursing offers a unique BSN program that can be completed in as little as 3 years. With generous financial aid options available, Chamberlain makes it easy for students to get the education they need to succeed in the medical field. Check out the official Chamberlain College of Nursing - Columbus nursing program.